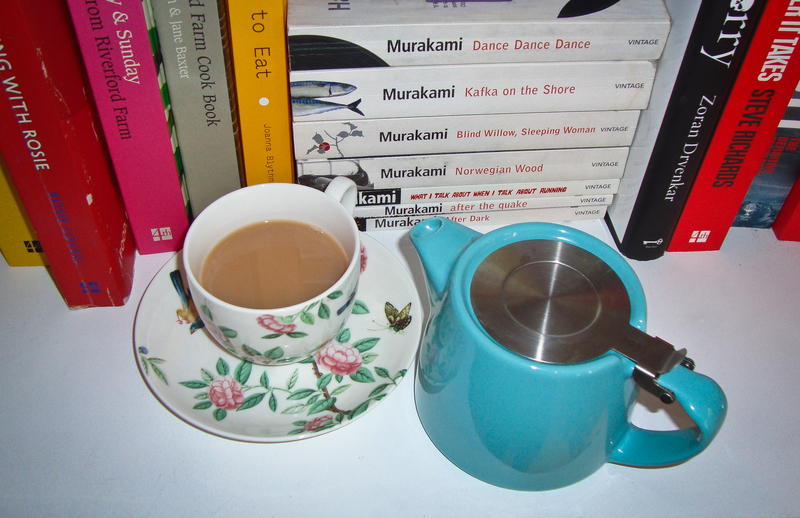 In a not completely un-granny-ish move, I appear to have developed a fondness for tea. Not herbal tea, which fills my cupboard and makes ‘”do you want a cup of tea?” a question that needs a few serious moment’s contemplation before I can answer. Or Matcha tea, which might initially taste a bit ‘pond-y’ but is a brilliant green colour and a bit addictive. But normal tea. Builder’s tea. With milk. And one sugar. Tea drinking isn’t something that I do very quickly. One of the reasons I drink herbal tea so much is that it’s still drinkable when it’s cold. No cloudy milk skin floating around grossing everyone out. Drinking Builder’s tea means drinking from a small cup, and brewing a small cup of tea, with a normal sized tea bag feels a bit stupid. So, with that in mind, it was time to find a teapot…! I had to discount the obvious floral numbers, because Mr Threesmallapples refused to let them in the house, so was feeling full of teapot-induced gloom, when a bike ride and a trip to the Tate uncovered this little beauty! The Stump teapot by Forlife, available in 9 colours, and holds 3 cups of tea. Perfect for a bit of lazy Sunday tea drinking. Now all I need to find is a milk jug.